Rich in history, with watersheds that provide clean drinking water for millions of people, and encompassing thousands of acres of state parks and state forests, the Hudson River Valley National Heritage Area is a unique and cherished landscape. While significant portions of the valley have been preserved through careful development, its natural legacy is threatened by population growth and sprawl. Over the years, The Trust for Public Land has assisted the state, counties, and municipalities in protecting more than 51,000 acres in the ten-county river valley area and today it is helping preserve the pastoral and natural lands that attract residents and support the valley's much-sought-after quality of life. 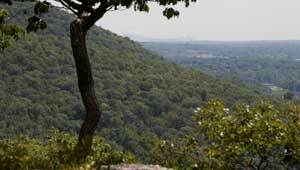 Recent successes include those at Torne and Ticeteneyck Mountains and the preservation of more than 18,000 acres within the Sterling Forest Highlands.